It’s hard for me to believe that April is almost over. I guess these blogs are good for keeping me in check with just how fast the year goes. With many schools winding down, I’m running full steam getting ready for NEXT school year. Once again our friends at Doodlebugs Child Care have sponsored my show for 2017/2018. It means that they cover the cost to perform at your child’s school. That’s right! 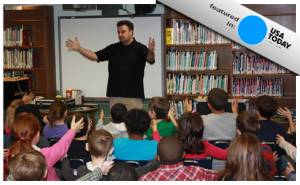 There is ZERO cost to your school or PTA if they book me with The Say No To Bullying Magic Show. But really it means Doodlebugs cares about our community and your children. It means they care about your schools and their well-being. Now, this does come with some small words of warning. Doodlebugs ONLY sponsors a certain number of schools. Once this number is filled, it’s GONE! I can be reached at 716-698-2787 or mikeseege@gmail.com. Call, Text, email. Just get your school on the list! DON’T MISS OUT! Now that that’s over, I hope everyone enjoys the great weather this weekend and gets out to enjoy WNY! Have fun!